Great symbolic photo, Oliver: a modern Diogenes looking for Man-Liberty! Very nice, shot with my favorite film! aber wie marx schon sagte: "freiheit ist die einsicht in die notwendigkeit"
der hund kann also nicht lesen?! Das kannte ich ja noch gar nicht. Gefaellt mir sehr gut!! very nice snapshot, really amazing. 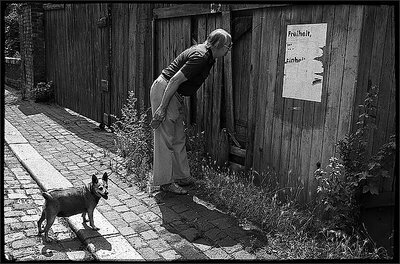 This is really a great photo with story behind...the capture of the man,trying to read the torn paper,and his dog and the light and shadows are excellent. Great story ! well done ! excellent, in the purest tradition of some great masters! Outstanding capture! Wonderful contrast and tones. Fascinating. Like where Winogrand would have left off. Interesting capture, wonder what he is peeking in on through the fence. He looks like he has approached it with trepidation and is not sure what is going on. Splendid light and shadows. great texture and is awesome in B/W.